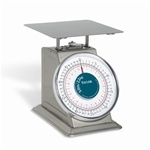 Kitchen Scales for Restaurants are a critical piece of gear for any chef. Our restaurant supply Scales are strong and durable for use in hot kitchens and impervious to liquid spills. The Commercial food Scales have been used for generations to make sure that food is portioned correctly and that ingredients are added consistently. They are either digital or manual for kitchens. Edlund Extra Scale - 1 Oz. Edlund Stainless Steel Scale - 25 Lb. Edlund Standard Scale - 32 Oz. Taylor Digital Portion Control Scale - 10 Lb. Taylor Stainless Steel Cild Scale - 150 Lb. Taylor 32 Oz. Stainless Steel Platform Scale - 9 in. x 9in. Taylor Stainless Steel Scale - 50 Lb. Taylor Ice Cream Scale -32 Oz.x 025 Oz. Taylor Rotating Dial Scale - 25 Lb. 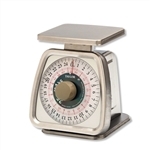 Taylor Rotating Dial Scale - 32 Oz.x 0.25 Oz. Taylor Rotating Dial Scale - 4 Oz. Taylor Rotating Dial Scale - 5 Lb.x 0.5 Oz. Update International Dial 2 Lb. Scales - 7 in. Digital Portion Control Scale - 2 Lb. Hobart Ultima Scale Label Blank - 2.25 in. x 3.5 in. Hobart Quantum Blank Scale Label - 2.25 in. x 3.5 in. Scale Dial - 7 in. Scale Rotating Dial - 7 in. Dial Two Pound Receiving Scale - 6.5 in. Buy your cafeteria kitchen Scales from the leader in restaurant supply. Wholesale Scales are much more durable than retail ones and more accurate as well. Exact portions help you provide consistent quality and service to your patrons each and every time. People eating out like consistency.